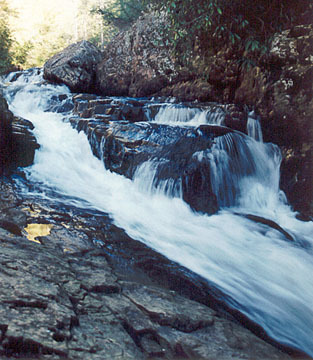 It seems that few people, outside of local trout fishermen, know about the Chauga Narrows. 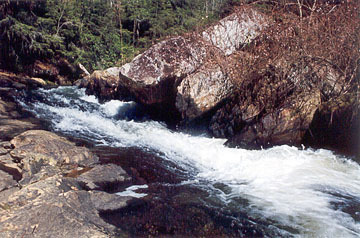 The Narrows are a Class V or VI rapid on the Chauga River (one ridge east of the Chattooga). 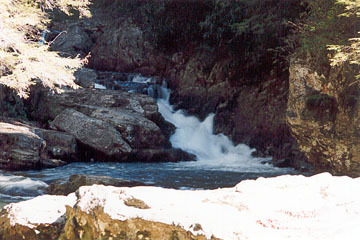 The river drops 20-30 feet over less than 100 yards, including a stretch where the entire river is forced through a channel two or three feet wide. 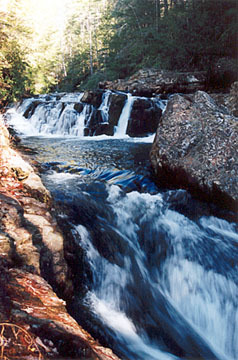 It begins with a short, tiered fall that feeds into the previously described channel. After a section of flatwater, the river drops another five feet. The easy-to-moderate .5 mile hike follows the left side of the river downstream from the Blackwell Bridge past an old log cabin on an old road. At a 90 degree turn in the river, the road ends and a well-worn path continues downstream over roots and fallen tree trunks. You'll have to carefully descend to the river from the sometimes slick hillside once you hear and see the Narrows on your left. Directions: From Walhalla, drive west on SC 28 for 7 miles and turn left onto Whetstone Road (Just before the Mountain Top Trading Post). Drive 4 miles to Blackwell Bridge over the Chauga River and park on either side of the road beyond the bridge. 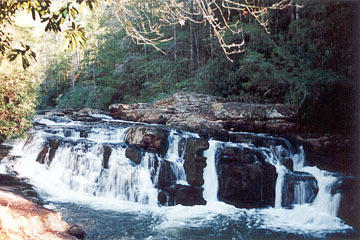 Hike downstream to the falls.